“Saturday Night Live” and “30 Rock” star Jason Sudeikis better hope he was born to run. Sudeikis has signed on to co-star with Jennifer Aniston and Gerard Butler in “Bounty Hunter,” according to The Hollywood Reporter. The comedian will play Aniston’s co-worker, who is somehow convinced she’s in love with him. (If we had a nickel for every time that happened at the office…) Unfortunately for their love, Aniston is a bailjumper being tracked by her bounty-hunter ex-husband (Butler). Probably it’s no surprise to expect real sparks to fly between the Aniston and Butler characters, leaving poor Jason all alone. 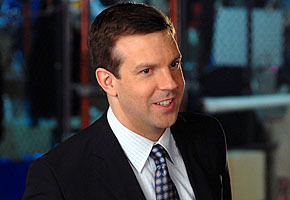 Though he’s been a frequent guest star on “30 Rock,” Sudeikis wasn’t featured in Aniston’s sole appearance on that show. Bradley Cooper’s already denied dating Jennifer Aniston, but the He’s Just Not That Into You costars were spotted having a late-night dinner à deux last night. The two shared pasta, steak and salad at Il Cantinori restaurant in Manhattan. There was no hangover for these two…they sipped Pellegrino water instead of alcohol. The restaurant’s manager says Jen is a frequent customer, but this is the first time she’d brought in her new boy-toy. “They were very nice and chatty,” says the manager. They were first spotted together at a party in May for her flick Management. Jen’s currently in NYC filming The Bounty Hunter with Gerard Butler. I’ve added scans of Jennifer in the June issue of UK Cosmopolitan. Enjoy!